At seventeen, Reef is an embittered young offender who is barely able to contain his anger at the world over the death of his grandmother, the only person who had ever shown him love. Leeza is mourning the death of her older sister from cancer. When Reef, in a moment of rage, hurls a stone off an overpass into traffic, it shatters both their lives and throws them together in the most unexpected way--and offers them both a chance at healing. QUESTION: Where did you get the idea for this novel? DON: Every piece of fiction I’ve ever written—whether novel or short story—has grown out of something that has bothered me, kept me awake at night, wouldn’t leave me alone. As I was mulling over ideas for a third novel, the daughter of a friend was killed when a stolen vehicle, driven by a teenager trying to evade police in a high speed chase, struck her car. Following this tragedy, I couldn’t stop wondering how that teenager might cope with the knowledge that his recklessness had cost a life and irrevocably altered the lives of many others. Before long, I had a character in mind, a teenager with absolutely no regard for the well-being of others who commits an act that results in the death of an innocent bystander. As I continued to think about him, though, I began to see other possibilities for the story and to wonder how my character would handle having to deal firsthand with the results of his actions, actually having to face the person he has hurt—not killed—and to try to make restitution. It was at this point that I knew I had my story. QUESTION: Didn’t something like that happen in Halifax a year after your novel was published? DON: Yes, an educational assistant was killed when her car was struck by a stolen vehicle. It, too, was driven by a teenager trying to evade police. Such a tragedy. QUESTION: So you began with a male teenager who gets in trouble with the law? DON: Not exactly. The main characters of my first two novels were male, and I thought it might be interesting to have a female lead in my third book, so I considered making Leeza my protagonist. However, the further I got into the story, I became more and more intrigued by what could have driven Reef to throw that rock off the overpass. As I pondered his backstory, I “discovered” the experiences that had shaped him and made him the person he was becoming. Reef surprised me as I was writing the book—I originally thought the story would take a far different direction, but Reef had other ideas. I'm always surprised (yet secretly pleased) when characters won't do what I tell them to do. QUESTION: Is Reef a real person? DON: None of my characters are real people. However, like any writer, I often use details and characteristics of real individuals when I “flesh out” the people in my stories. For example, the character of Frank Colville was modeled after a close friend of mine who once worked in the penal system. But at some point in the process, each character steps away from the model and takes on a life of his or her own. If they don’t, I haven’t done my job. QUESTION: Who is your favourite character in The First Stone? DON: My favourite is Scar. I admire the empathy she feels for others, the way she stands up for people despite what those around her might think. I wish I’d had her courage when I was her age. QUESTION: Have people been shocked by your use of profanity in this novel? DON: Generally speaking, readers (certainly students but many teachers and librarians as well) have responded favourably to its use, although there are, of course, some who have criticized it. I struggled with this issue for a very long time when I was writing the novel (I've lost track of the number of times I reprimanded my own students for using in our school’s hallways the same expressions I included in this book), but Reef and his buddies simply refused to say things like "Gosh!" and "Oh, darn!" I tried for weeks to make them use more appropriate language, but they wouldn't. Fortunately, Reef discovers during his bus ride with Bigger in Chapter 23 how limiting that language is, and I'm grateful to Robert Frost for writing the words in the novel's epigraph that sum up the frustration all of us feel when we're unable to communicate the things that are most important to us. (In fact, I think that's why I became a writer.) I would hope that people wouldn’t condemn The First Stone simply because of its strong language. Yes, it contains the f-word and several other profanities. But it also contains a character who must face the tragic consequences of his own thoughtless cruelty. Which is more important? QUESTION: You’ve taught both junior and senior high students. How did you react when your students used profanity in their own writing? DON: I found it useful to ask my students the following two questions: first, does profanity in your writing serve an actual purpose (beyond raising readers' eyebrows); and second, is it something you wouldn't mind your parents reading? After all, writing folders function as—among other things—a record of a student's writing achievement over time, and parents are encouraged to read their contents. When my students realized that their parents would likely see what they'd written, their desire to use profanity tended to dwindle. Those who continue to include it do so because they can defend its purpose. QUESTION: How long did it take you to write The First Stone? DON: I began the novel in 1998 and wrote about half of it, but then I got sidetracked by several other books. I was hired by Nelson Canada to work on a series of textbooks called Language & Writing, and my co-author—Dave Hodgkinson—and I wrote the grades 7 to 11 books over the next four years. I wasn’t able to get back to the novel until 2002, but I was actually glad that happened because the story ended up taking a different direction than I had originally planned, and I found this direction better. Also, when I began the book, I had been writing about the Young Offenders Act, but the Canadian Government eventually replaced that legislation with the Youth Criminal Justice Act, so this is another reason I’m glad I didn’t finish the book in 1998—it would have been out of date with regard to the legal system. Of course, finishing a manuscript isn’t actually finishing a book. Once my agent sold it to HarperCollins in 2002, it went through the editorial process, and it was nearly a year later by the time it appeared in print as you see it now. QUESTION: Leeza’s mother prevents Leeza from seeing Reef again. Is it possible to impose a restraining order upon someone when the person being protected wishes to be in contact with the person being restrained? DON: At 17, Leeza was still a minor, and parents have the legal right to make such decisions. More important, though, Leeza hadn't expressed to her mother a desire to see Reef. After all, he was the person who had shattered her body and her spirit. It wasn't the restraining order that kept Leeza from contacting him—it was the overwhelming sense of betrayal she felt at learning what Reef had done to her. Although his friendship had helped her cope with Ellen's death, his action had brought her months of physical agony, something she could never forget. QUESTION: Why did you choose the title The First Stone for your novel? DON: Titles are a funny thing. When I write short stories, their titles never appear until I've finished them. With novels, it’s different. The titles of three of my novels—Of Things Not Seen, The First Stone, and One on One—came even before I began writing the books. (However, the title of my second novel, Stranger at Bay, did not come to me at all. It had a "working" title for several months, but I really didn’t like it. My editor and my publisher offered several suggestions, and Stranger at Bay is actually a combination of two that they suggested.) 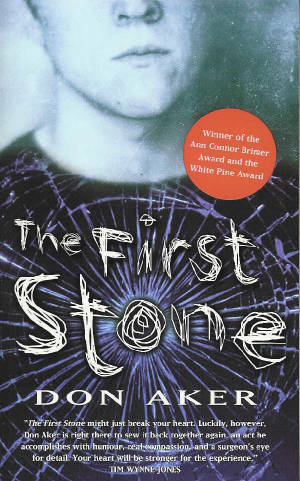 Regarding the title of this novel, stones are significant because they were a source of comfort in Reef's disadvantaged childhood. His grandmother placed "the first stone" in his hand the day his grandfather pulled over to the roadside when Reef was carsick, telling him that the smooth-edged stone she found was a "sick-stone" that would keep him from throwing up. (I used to do the same with my younger daughter, who frequently became carsick when she was 4-5 years old. Each time she grew nauseated, I'd park on the side of the road and find a smooth, round stone—which I called a “sick-stone”—and tell her to grip it tightly. Focusing on that one thing often helped her forget her nausea.) Later, when Reef began bringing them home to his grandmother, stones became a focus for communication. They spent hours together sorting them and talking about how some were like—and unlike—each other, and it was during these times that his grandmother would talk about Reef's mother. After Reef's grandmother died, stones offered another kind of solace as he used them to vent an anger that continued to build inside him during years of being shunted from one foster home to another. It was this anger that led him to throw the rock at Leeza's car, and it was this anger that led him to throw the rock at the greenhouse, shattering a panel that Frank Colville insisted he pay for and repair. The title appears again at the end of each of the last two chapters—Leeza hears the phrase at church in the minister's sermon, and the words remind her of the importance of forgiveness; and, in the novel's final sentences, Reef holds "the first stone" that he did not throw in anger. It’s the stone he found on the beach the last day of summer, and he carries it with him to all his presentations, a concrete reminder of where he has been and how far he has come. I like the fact that, at the end of the novel, a stone is once again a source of comfort for him. QUESTION: Some Atlantic readers have expressed disappointment that you changed some details about Halifax. How do you respond to that? DON: I think it's actually kind of nice—a testament, in fact, to Atlantic Canadians—that this is even an issue. In my original manuscript, I included real streets, buildings, and place descriptions, but only a few remained in the final draft because of legal considerations. For example, my editor was worried—and rightly so—that an impressionable young reader might want to recreate the moment with the rock on the overpass if I had named actual streets. QUESTION: The novel didn’t end the way I expected it would—at least, not the way I wanted it to, anyway. Why didn’t you have Reef and Leeza get together at the end? DON: The First Stone was one of five books chosen to be debated on CBC's 2006 Young Canada Reads program and, although everyone on the panel liked it, the novel was ultimately voted off because some of the panel members found the ending unsatisfactory. Nearly every person who writes me about The First Stone says the same thing—they wish Reef and Leeza had gotten together. If it's any consolation, I had originally planned for this to happen and, in fact, I even wrote that ending in my first draft. However, while I was researching the treatment of accident victims, I saw several patients at the Nova Scotia Rehabilitation Centre with injuries similar to Leeza’s. These people endured months of agony during their recovery and, seeing what they experienced, I decided it just wasn't believable for Leeza simply to forget or ignore what Reef had done to her. She had suffered too much for too long to do that. Hopefully, though, there will come a time when she can put this behind her, and I tried to suggest near the end of the novel that this might one day happen. QUESTION: Do you think you’ll ever write a sequel so we can find out for sure? QUESTION: Do you think anyone will ever make a movie of The First Stone? DON: The book has attracted some interest among filmmakers, especially since young offenders continue to make headlines, and a few producers have actually considered it. So far, though, no one has optioned it for a film. The producer who has expressed the most interest so far commented that he’d want to change the ending. I guess everyone wants that “Disney denouement.” I’d have a hard time agreeing to a change like that, though. As I said earlier, I don’t know how Reef and Leeza could believably get together again, unless the film leaped ahead a year or two. Leeza would need time to heal emotionally. Read a complete review online.